Newport Coast is very affluent area of Newport Beach in Orange County, California. 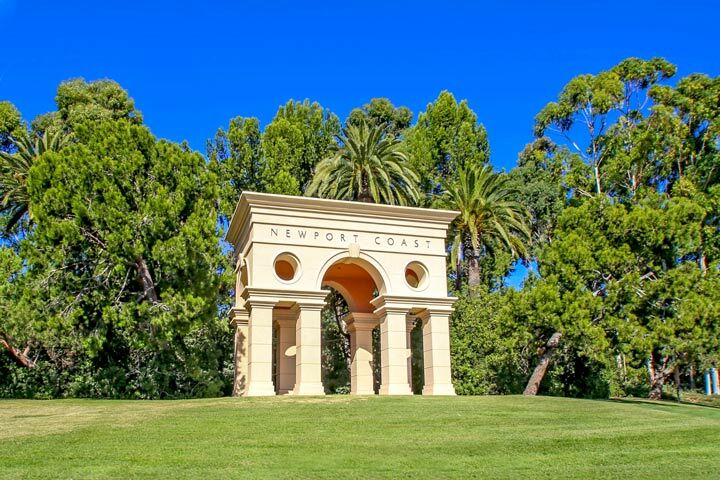 Situated between Newport Beach and Laguna Beach, Newport Coast boasts some of the most expensive real estate In Orange County with architectural styles ranging from Tuscan inspired homes to your classic Mediterranean style estate. These large estate homes have forever Ocean, Catalina Island, mountain and city light views. The Pelican Hill area is a perfect example of luxury at it's finest as Newport Coast is a seaside community ideally located near championship golf courses and just minutes to Fashion Island Shopping Center and fine dining. Newport Coast features many gated communities that are some of the most sought after communities here in Orange County. The city features lots of wide open spaces and grand views of the blue Pacific Ocean. One of the newer developments in Newport Coast is the Crystal Cove community with notable neighborhoods like Crystal Cove Sea Point, Crystal Cove Sea Crest, Nautilus, Oceana, Seabourn, Seacape, The Strand, The Tides, Watermark, White Sails and Windward. Newport Coast has many luxury areas that are home to several neighborhoods within the guard gates and include Newport Ridge, Pacific Ridge, Campobello, Ocean Ridge and Pelican Ridge. Newport Ridge contains six communities consisting of Aubergine, Montserrate, Provence, Rivage, St. Michel and Ziani. Pacific Ridge contains four great communities of Belcara, Costa Azul, Cypress and Pienza and three Ocean Heights communities of Perazul, Cassis and Strada. All of these Newport Coast community homes for sale can be found to the right of this page. Newport Coast bank owned homes rarely come on the market since most homeowners usually pay all cash for their Newport Coast homes. If you are looking to research what homes have sold in Newport Coast we have created a dedicated page for all home sales in Newport Coast. Please visit our link to the right "Newport Coast Sold Search." You can research all the Newport Coast home sales for the past 12 months. We have included the most expensive homes for sale in Newport Coast. Some of the most expensive neighborhoods in Newport Coast are the following communities: Pelican Hill, Pelican Crest, Pelican Point where homes for sale are priced above $10,000,000. If you are looking for a Newport Coast rental home for lease we have a dedicated page for all Newport Coast Rentals. Please contact us at 1-888-990-7111 with questions regarding the Newport Coast area and any of the homes listed for sale here. "A Coral Canyon home in Newport Coast, California have just sold by Michael Franco of Beach Cities Real Estate who represented the buyer. nbsp;28 Sea Fair, Newport Coast sold for $4,760,000 and clos... "
"Two Coral Canyon homes in Newport Coast, California have just gone under contract by Michael Franco of Beach Cities Real Estate. nbsp;18 Sea Fair amp; 23 Sea Fair are currently under contract and r... "
"A Seascape Crystal Cove home has just been sold by Beach Cities Real Estate agent Michael Franco who represented the buyer. nbsp;42 Sidra Cove, Newport Coast sold for $3,400,000 and closed escrow o... "
Based on information from California Regional Multiple Listing Service, Inc. as of April 23rd, 2019 at 1:47am PDT. This information is for your personal, non-commercial use and may not be used for any purpose other than to identify prospective properties you may be interested in purchasing. Display of MLS data is usually deemed reliable but is NOT guaranteed accurate by the MLS. Buyers are responsible for verifying the accuracy of all information and should investigate the data themselves or retain appropriate professionals. Information from sources other than the Listing Agent may have been included in the MLS data. Unless otherwise specified in writing, Broker/Agent has not and will not verify any information obtained from other sources. The Broker/Agent providing the information contained herein may or may not have been the Listing and/or Selling Agent.